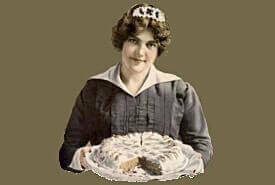 Old fashioned ice cream cake recipes were prized in the Victorian Era. Some say this luscious layer cake's name came about because its soft sponge texture and thick, creamy filling made it taste similar to homemade ice cream. Others say it earned its name because it became popular to serve with ice cream. Whatever the case, this rich, homemade cake makes a wonderful treat for any occasion. In truth, it makes the occasion! These Victoria-style sponge cakes taste every bit as good as they look. Two cups sugar, one of butter, three and a fourth cups flour, one-fourth cup sweet milk (some take two cups flour, one cup cornstarch, and one of sweet milk), two teaspoons baking powder, whites of eight eggs, flavor and bake in jelly tins. Aunt Babette was famous for the high quality of her dessert recipes. Just imagine serving this vintage five-layer sponge dessert cake to your appreciative guests at a party. Take one cup of butter and two cups of pulverized sugar rubbed to a cream. Then add gradually one cup of milk and three cups of sifted flour, with two teaspoonfuls of baking powder sifted into the flour and last the stiff-beaten whites of eight eggs. Bake in thin layers. Four cups of powdered sugar, one small cup of boiling water. Boil until clear and thick like syrup and then pour on the beaten whites of four eggs, beating as you pour in the syrup, and stir until cold. Then add one teaspoonful of citric acid (pulverized, of course). Flavor with vanilla and spread between layers and on top. This quantity will make about five layers. One cup butter rubbed with two cups white sugar to a cream, one cup sweet milk, three and one-half cups flour, three level teaspoons baking powder, and whites of eight eggs. Bake in jelly tins, and put together with boiled icing flavored with orange. —Mrs. C. H.
Ingredients: 1-1/2 cupfuls of sugar, 2-1/2 cupfuls of flour, 1/4 cupful of butter, 1 cupful of water, 2 rounding teaspoonfuls of baking powder, whites of five eggs. 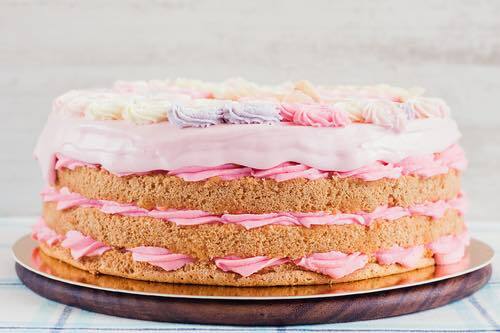 Now, you can make a delicious, old fashioned ice cream cake from almost any white cake recipe with the help of this special boiled frosting recipe once favored by chefs in the White House kitchen. Make an icing as follows: Three cups of sugar, one of water; boil to a thick, clear syrup, or until it begins to be brittle; pour this, boiling hot, over the well-beaten whites of three eggs; stir the mixture very briskly, and pour the sugar in slowly; beat it, when all in, until cool. Flavor with lemon or vanilla extract. This, spread between any white cake layers, answers for a simple "Ice Cream Cake." Traditional ice cream cakes are known for their thin, light layers thickly spread with creamy white icing, though there were variations. 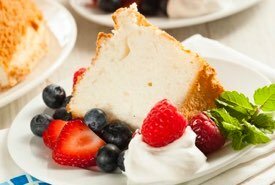 Follow the old fashioned ice cream cake recipe and bake the thin layers in jelly roll pans or in regular cake pans that are only partially filled with about 1 inch of batter. 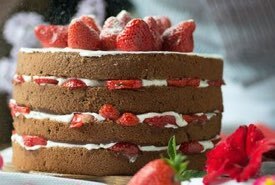 These dessert cakes are simple to make, but they are finicky regarding cooking time and oven temperature, so keep a close eye on them while they bake. Also, since the cake's lightness comes from the air trapped within the batter, don't skimp on the time spent in beating. The luscious, creamy filling and the multi layers of moist white cake are what really sets this cake apart, so don't skimp on the filling. One cookbook author goes so far as to call it the "Queen of All Cakes!" You'll want to try this classic dessert. It's extra special! This old time dessert cake is perfect serving at birthdays and parties, as it always proves popular with cake lovers. 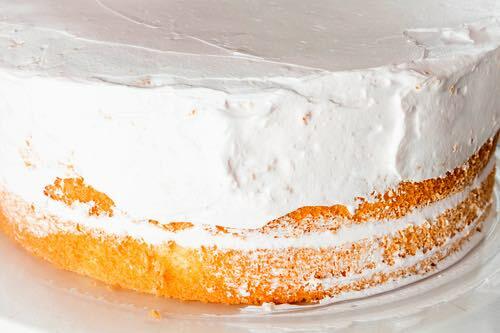 Whether you want to make a special cake for a friend, or a lavishly decorated five-layer classic for a party, these old fashioned white sponge cakes will serve you well.